Marta is a freelance journalist and NGO worker. She studied Journalism in Lisbon and specialized in Middle Eastern Studies at Leiden University in the Netherlands. She has worked with human rights, peace-building and development NGOs in Portugal, the Netherlands, Bosnia-Herzegovina, Turkey and the West Bank. Her research interests include social justice, human rights and the intersections of art and politics. 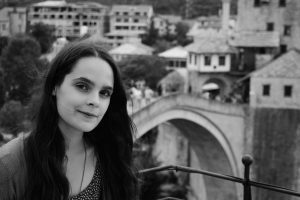 She writes in English and Portuguese and her work has been featured in Al-Jazeera, Middle East Eye, Publico, Observador, among other publications.